Funny Anchorman Shirt Features Hilarious Seve Carell, Must See! 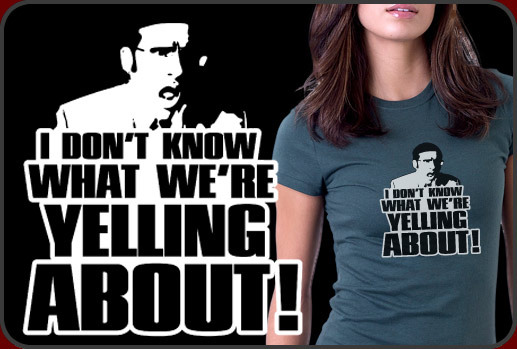 Hilarious Anchorman Shirt featuring Steve Carell wants to know what we're yelling about. One of our favorite scenes in the film, Anchorman is when the all-male news crew is taking turns yelling at the station manager about the new female addition to the news team. Steve Carell's line, I Don't Know What We're Yelling About! is so priceless that we had to design an Anchorman shirt around it. It's one of those must-have shirts for fans of the film. This Anchorman Shirt is available on all sorts of shirt styles and colors and looks great in either light or dark colors.